"The finish is not as nice as if a Japanese craftsman had done it," he says. "But on the other hand, it costs only a fraction of the same thing handmade in Japan." These boxes will carry Bull's exquisite reproductions in scroll form of an ukiyo-e painting by Kaigetsudo Ando, who worked in Edo in the early 18th century. In his studio he shows me this colorful woodblock print, which is carefully mounted on a silk scroll. "This one image took me one full year to make," Bull says. "So far this is my biggest accomplishment." Not only for the time it needed, but also it marks a step up in sheer size from his usual smaller format woodblock prints, which he has been making for more than 20 years. 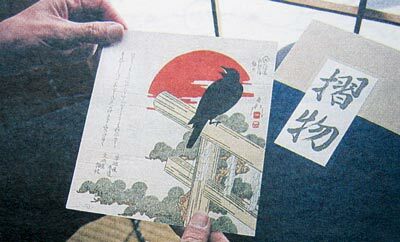 His woodblock print series are made in editions of about 200, and are collected by Japanese and overseas clients. 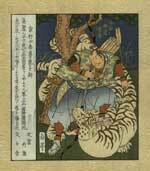 In 1998, he completed his Hyakunin Isshu series, a set of prints depicting poets of ancient Japan. It took him 10 years. Interestingly, in Japan, woodblock prints are not highly regarded today - unlike calligraphy, pottery, ikebana, or haiku, Bull explains. 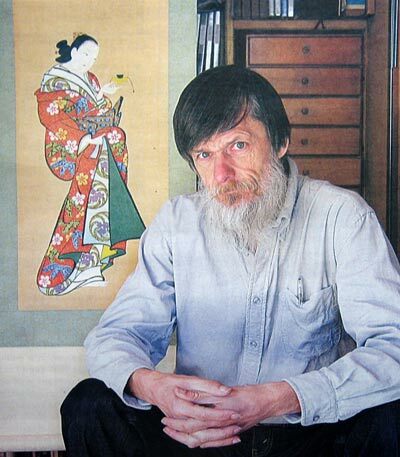 So how did he get interested in the world of moku hanga? "Thirty years ago, I lived in Toronto, Canada," Bull recalls, "and there was a boom in Japanese restaurants. I liked the light, fresh food there, and gradually became interested in Japanese culture as well." One day a local gallery was showing Japanese woodblock prints, and he was intrigued, and became fascinated by them. He was very curious about how the prints were made, and loved the colors and texture of the works. "A seed for my future life was planted right there in that gallery," says Bull. Then, on a train from Toronto to Vancouver, he met a Japanese woman, fell in love and in 1986, moved to Japan with her. 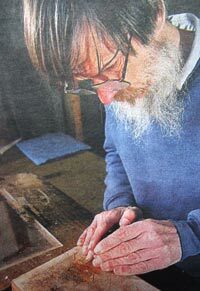 "I originally worked as an English teacher and studied woodblock printing by myself," he says. "My teachers were the long-gone workers from 100 years ago, and I had to learn everything from scratch - the reproduction of the image, the carving, the printing, the selling." In older times, Bull continues, "designing the print, carving it, printing it, and publishing were all done by different people. Everybody involved was the top in his field, and that is why the superb craftsmanship of these old prints never again can be reproduced." Bull jokes that, "I am maybe one of the best carvers alive today, but certainly not the best printer!" Nevertheless he plans to take the ultimate step, to design the images for his next print series "My Solitudes" as well - a personal challenge he very much welcomes. This new project will consist of prints of three places (a riverbank, a forest, a sea coast) during the four seasons of the year. These woodblock prints will be published in editions of 12 fine-printed and bound books, featuring stories of his experiences in Mother Nature as well. "It is incredible," he says. "There are these absolutely quiet remote places right in Tokyo where you don't meet a soul and the hectic city life seems far away. Sitting quietly in front of my tent, I am never bored.